Last month, we spray painted the story on Elder Schuller “officially” filing bankruptcy. It was like the quartet on the Titanic finally admitting to each other, “You know, with all these people frantically screaming and cursing the iceberg, I think we have a problem.” Nevertheless, he filed and no one was stunned. It seems this 84-year-old captain refuses to go down with the ship, according to the USA Today. That, or just wants one last cash grab for retirement. Yeah, in this tough economy, we call that begging. Let me get this straight: the Crystal Cathedral is $43 million in debt, is full of namby-pamby folk who “appreciate” positive thinking… and God, and has become the laughing stock of ecumenism. Yet, the place where believers go to retire is going to become “double-tithers.” Keep it classy, Pops. She assured church members Sunday that using “Biblical” money management the church would get out of bankruptcy. The congregation gave a standing ovation near the end of his daughter’s remarks. That’s nice, but is it practical? 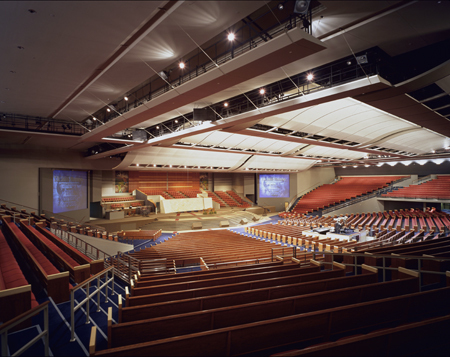 This church is hemorrhaging and is home to thousands of believers. And now they are being held hostage to an infomercial of inspiration in an effort to corral millions of dollars. Oh sure, blame the recession (he did), don’t pay your bills (he didn’t) and then hoard the cash. Why do pastors with any notoriety fall in love with the fruit from the believers more than the believers themselves? We hope that guy will be the exception, but then stories like this keep coming up. Does anyone have any sense? Yeah, that’s very logical but like anyone is going to pay to hear preach. Ah well, our heart will go on. God willing. News hailing from the Orange County Weekly and Reuters reports what we only knew was just a fleeting moment away: the nation’s first megachurch, the Crystal Cathedral, has filed Chapter 11. 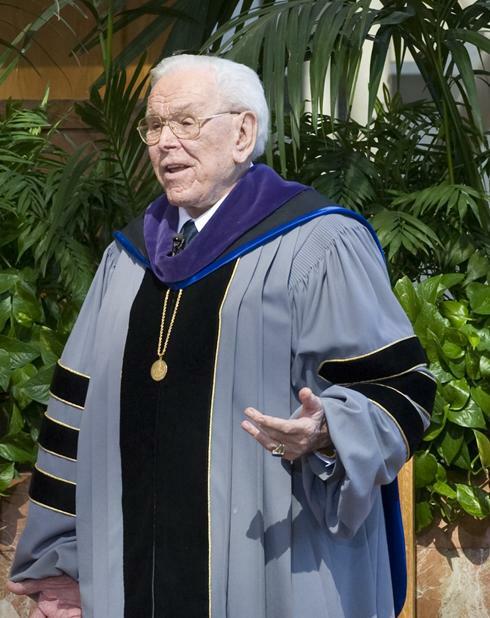 Crystal Cathedral Ministries, founded by Dr. Robert Schuller, best known for its weekly “Hour of Power” television program that it claims has 20 million viewers, listed assets and debts of between $50 million and $100 million each, according to documents filed on Monday in U.S. Bankruptcy Court in Santa Ana, California. Its largest creditors include several U.S. television stations. What began as a sticky family divorce is now a nasty separation of church and state. Pity. This is a guy who created more than a trend; he established the genesis of the modern church – run like a business, looks like a corporation and “feels” like a church. Oh yeah, that one. 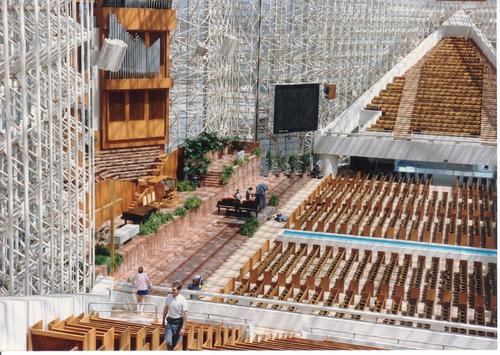 Maybe if Schuller had ditched the endless tours and paid more attention to his church, the Crystal Cathedral wouldn’t be in this situation today. Or maybe he understood that it’s Christ’s message that’s more important, not so much paying bills on time. MEMO to the Elder Schuller: You know, if you weren’t kicking your son out of the pulpit, making your church into an Amway convention, skipping town on your bills and deciding the only way to save the place is give those same tired motivational messages (instead of sticking to the power of the Gospel that got you there in the first place), perhaps you would still have a church. However, there you are blaming the recession or whatever else sounds biblical in the face of a tragic decline in giving and church participation. Take it from all the talking heads on the national networks. These are the days of a persnickety shopper. If you don’t give them a reason to invest their money, they won’t. Moral of the story? The secondary opportunities that come up as a result of your ministry are just that – secondary. Tend to the greater vision at hand and all those other things will happen. Don’t worry about sheering out a TBN contract when you should have been tending to your flock. Oh, and your family. 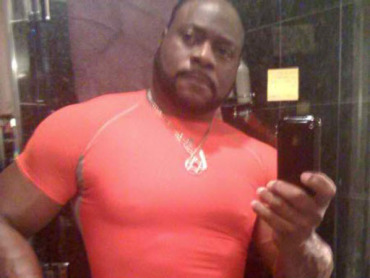 Don’t look now, members of the New Birth Missionary Baptist Church, but all those swolled muscles of Eddie Long’s won’t do him any good. As his devoted flock cheered, Long joked that he accidentally led them to the wrong page. “That was the Holy Ghost,” he said, flashing a smile as the sanctuary echoed with laughter. As if, the wicked are those puerile boys who have collectively claimed under oath that a “Mand of Gawd” would have the unmitigated audacity to act in such a way. Yeah, that’s wicked all right. If they are lying, then they deserve a world of destruction. But if they aren’t, and this case ends up in a room of attorneys vying for a cash grab because someone is skeered of a guilty verdict, then the only clothing of shame is going to be the next pin stripe suit Long uses to cover his muscles. So, instead of vehemently denying the charges that could pummel his family and plummet his charge, Eddie Long chooses to wax theological and avoid the issue in hopes for more dramatic applause. I admit. I abhor this story, not only because of the heinous charges this poses against anyone who is called according to the precepts of God. Moreover, because of the blind arrogance the defense of these charges has created. 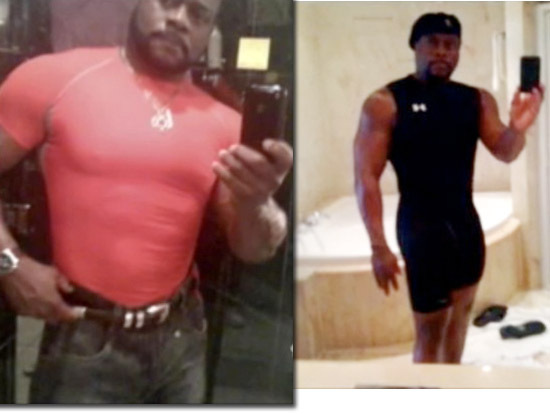 MEMO to Eddie Long: We are all his anointed ones. We all have a purpose. And we are all vessels of his Word… his prophets. I pray these charges are false for the benefit of your family, your church and the millions of believers that have supported you through the years of your ministry. However, if you “touched” God’s anointed ones and caused his four “prophets” a lot of “harm” then a street fight is going to be least of your lawyer’s… eh, your concerns. NEWS FLASH: His statement cometh. Of course, that’s what Bishop Eddie Long‘s lawyers had to say late yesterday as he posted a well-crafted and certainly sincere statement to his website. All I ask is for your patience as we continue to categorically deny each and every one of these ugly charges. Maybe it's a P90X before and after shot? Well, that’s reassuring. Granted, this media feeding frenzy of him boinking armor bearers (my assumption on the armor bearers can be read here) and sending pictures of the Bishop all swolled in spandex (more on that in a moment) has the Christian nation in quite a kerfuffle. One famed and scarred preacher in particular (again, keep reading for that gem). I am anxious to respond directly to these false allegations and I will do so. However, my lawyers have counseled patience at this time. Again, that’s nice. I mean, if I was a member of his church, I would certainly feel fine about him waiting almost a full week to tell me he’s not guilty. 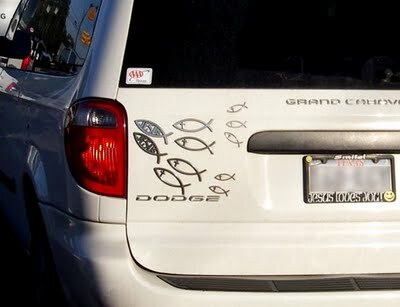 I’ve been around the Church for years. Decades even. And nowhere in my experience with consulting pastors do I see a passage of scripture that suggests rocking the UnderArmour to impress your sheep. Does that help them graze more effectively? Do you get more well-shewn Kashmir sweaters if the flock is exposed to the “gun show”? Yeah, I didn’t think so. Back to the statement. Bishop Eddie Long is hemorrhaging over this alleged incident, and yet, he allows his attorneys to make public statements for him… and that’s supposed to make it all right?! It’s bad enough he doesn’t care enough to immediately respond to this mess, he is having a gaggle of white folk talk noise to his highly not-so-white congregation. Yeah, that’ll do it. You dolt. There will nothing genuine about this retort because it didn’t come from him. The only that clearly did come from the Bishop are those pictures and the aggressive needs delivered by now four men. However, he pleads for mercy and understanding… and patience… has earned Eddie Long one fan: Meet Ted Haggard. Finally, as I have done for thousands of others over my decades of preaching, I ask for your prayers for me, my family and our church. On Sunday, at New Birth, I will respond to my congregation. And the world brother. Because believe me, we will all be listening. You know, just the way your lawyers planned it.